Titanium dioxide could play a vital role in developing the next generation of rechargeable batteries. Batteries are the future. From the increase in electric vehicles to storing energy on a grid-scale, to enable the move to more renewable power, the drive for better and longer-lasting batteries has never been greater. Creating such longer-lasting batteries with larger capacity isn’t straight forward, and there remain several problems to overcome. Although far from being a solution ready for commercial use, research has shown that titanium dioxide could play an important role in the future of batteries, in particular rechargeable ones. Most batteries that are used for storing large amounts of energy – or designed to be recharged – are lithium ion batteries. 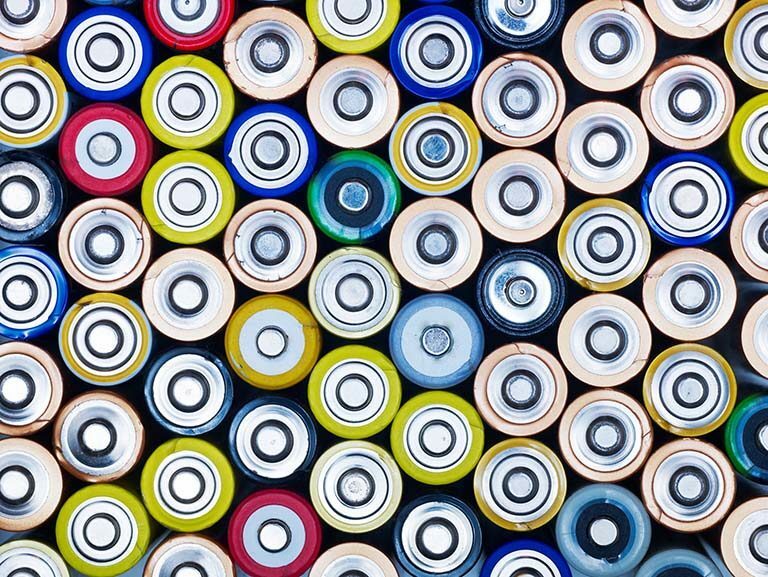 These batteries store and release energy by moving ions between the negative and positive ‘ends’ (electrodes) through a chemical called the electrolyte. When you charge the battery, the ions move towards the negative electrode. When the battery is being used, the ions flow towards the positive electrode, generating an electric current. In normal batteries, the process that takes place to generate an electrical charge can only happen once and in one direction. In rechargeable lithium ion batteries, however, the chemical process is reversible to allow the battery to be used again. From replacing the electrodes in new batteries, to speeding up the charging process, titanium dioxide (TiO2) has been proving useful in a variety of ways. “There are a few features about TiO2 that are useful for rechargeable batteries,” says Professor Colm O’Dwyer, from the University of Cork, Ireland, who has conducted research into the topic. The ability to recharge batteries is increasingly important for the growing number of mobile, electronic devices being used, and also in the shift to renewable forms of energy where variable solar or wind energy production can be smoothed out through efficient energy storage. In 2015, a team of researchers at Singapore’s Nanyang Technology University (NTU) developed a method to transform titanium dioxide nanoparticles into nanotubes by stirring. These tiny tubes, one thousandth of the width of a human hair, are created by a stirring method, which lengthens the particles into a tube shape. A gel containing the nanotubes was placed into the negative electrode of a lithium ion battery, instead of the traditional graphite. This accelerated the chemical reaction in the electrolyte, creating a battery that can be recharged to 70 per cent of its capacity in only two minutes, with an expected life span of 20 years. This means waste from batteries could be dramatically reduced. As batteries are used, the materials in them start to break apart; this is what causes the reduction in performance. But, as Professor O’Dwyer and his team discovered last year, when a porous version of titanium dioxide was added to a lithium ion battery, the battery materials remained intact after charging and discharging over 5,000 times. “This 3D arrangement of nanoparticles of the rutile phase of titanium dioxide is called an ‘inverse opal’ and is formed by infilling artificial opals made in the laboratory, with the active battery material,” says Professor O’Dwyer. In a battery, the porous version of titanium dioxide is conductive, without needing additives currently used in commercial battery electrodes. On top of this, lithium reacts efficiently with the porous structure, meaning the battery recharges quickly. Lithium batteries containing TiO2 may be referred to as lithium titanate (LTO)-based lithium ion batteries. Besides the charging improvements and longer service life, LTO-based lithium batteries are also safer as the battery constituents are more stable. 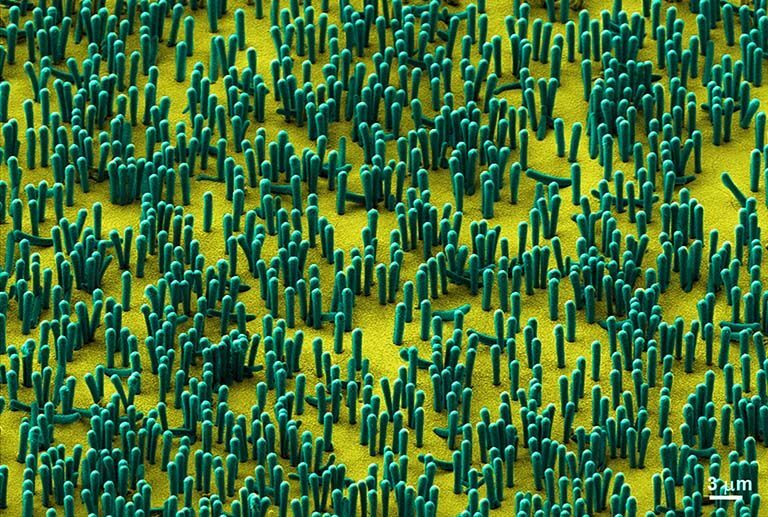 A nanoforest of nanowire lithium-ion batteries. But it’s not all about lithium ions. When a lithium ion makes its way from one electrode to the other, one electron is transferred. However, researchers have started experimenting with other metals, known as multivalent metals, in which two or more electrons are transferred for every ion. The more efficient nature of the reaction could increase battery storage by two or three times. The only problem is working out what kind of materials should be used for the components of these batteries. Research published in September last year, by a team including Dr Benjamin Morgan, from the Department of Chemistry at the University of Bath, England, found that replacing the negative electrode with titanium dioxide can allow a multivalent battery to work. This is because the titanium dioxide can be adapted to deliberately introduce defects, which provide a space for ions such as magnesium and aluminium (multivalent ions) to fill, transferring more than one electron each time. The effect of this on a battery is that it could store more energy than the equivalent-sized lithium ion battery. One plus of using titanium dioxide in batteries of the future is that it is abundant. On top of this, “the form of TiO2, after it reacts with lithium cycle after cycle, is very stable in many battery electrolytes for long lifetime usage,” says O’Dwyer. But there remain some challenges. “TiO2 as an anode (positive electrode) has a higher voltage than the currently-used graphite,” says O’Dwyer. So when it comes to titanium dioxide, even if it can be developed for commercial use, it may not be the answer to all rechargeable battery problems, but it could be the solution to some. “It may not be the optimum choice for high-energy density batteries for electric vehicles, for example,” says Professor O’Dwyer.